On 5 December 2017, government officials, key private and public sector stakeholders, media and the winning young entrepreneurs from the far corners of South Africa gathered at a glittering celebration of The 2017 STEP UP 2 A START UP YOUTH ENTREPRENEURSHIP AWARDS. 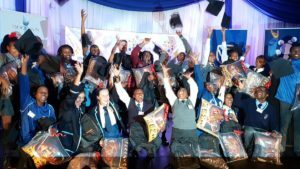 This was the culmination of a 5-month entrepreneurship development programme and competition for secondary school learners, made possible by key sponsors Standard Bank, Sasol and the MTN Foundation, amongst others. With input from industry leaders and experts, the Top 9 entrepreneurial teams who demonstrated the most innovative social or environmental business model were selected through a national competition and 3-stage adjudication process. The teams were then brought to Johannesburg for a 5-day intensive Entrepreneurship Boot Camp. The awards evening was the conclusion of the boot camp, where all finalists were awarded prizes (valued over 1.5 million) and the national winners announced. Prizes include Business Incubation, Bursaries, Cash, Gadgets and lots more. “It is imperative we instill the right mind-set for growth and provide essential support to develop ideas that will grow into highly successful businesses of the future. At Standard Bank, we are committed to youth entrepreneurship and enabling the youth to achieve their next big dream,” said Jayshree Naidoo, head of the Standard Bank Incubator. The event, was hosted at the Southern Sun Arcadia by programme partner Tsogo Sun, and attended by the honorable Jeff Radebe, Minister Lindiwe Zulu and, executives from STEP UP sponsors. “We believe that we need to empower young people who want to start sustainable entrepreneurial businesses by providing entrepreneurial skills and the tools they need to succeed. Initiatives such as STEP UP 2 A START UP allow us to do this” says Faith Khanyile, CEO of WDB Investment Holdings, Chairperson of Seed Engine and the WDB Seed Fund. The programme provides a step change in the lives of young people’s economic prospects, self-confidence and ability to gain economic traction after completing high school. Primestars Managing Director, Martin Sweet says “Promoting and enabling the next generation of African entrepreneurs is both a business and a moral imperative. STEP UP 2 A START UP’s aim is to achieve this by inspiring a culture of entrepreneurship and wealth creation early on in the career development path”. Step Up 2 A Start Up, now in its fourth year, focused on social entrepreneurship. This year, the inspiring road towards entrepreneurial excellence began on 12 August, launching at 17 Ster Kinekor cinema complexes nationwide. Over 15 000 Grades 9 – 12 learners from underserviced communities, benefitted from edutainment at its best. The feature film, produced specifically for the STEP UP 2 A START UP IV, had the audience glued to their seats! The National Youth Entrepreneurship Awards Ceremony recognizes participants and teachers who have been through all 4 stages of Step Up and have displayed entrepreneurial flair and commitment to solving a social or environmental problem in their community. Sipho Mlambo is one of the many wonderful success stories … Sipho was part of the very first Step Up 2 A Start Up competition in 2014. His winning team Solar Umbrella designed an affordable product to collect and convert solar energy into electricity. A fantastic innovation for communities to save on electricity costs. Sipho and his team mates experienced a once-in-a-lifetime trip to the United States to the 3M Innovation Centre. At this year’s Step Up 2 A Start Up launch, on 6 July, Sipho addressed the audience of 300 guests and the media to announce that he has successfully published his own book, listed it on Amazon and is counting the sales! This Public/Private Sector partnership has seen incredible support from leading corporates as well as National and Provincial government. This is evidence of a growing willingness to boost the development of SMME’s as a strategy to combat unemployment. Primestars’ passion is tangible, underpinned by a well-oiled team-machine, they are honoured to have created this platform for government and sponsors who share the vision and the potential it holds for offering young SA a better future. We wish the winning teams the best of luck in their journey to becoming successful entrepreneurs!